Physicians can earn degrees to practice medicine in the US and the European Union. Thomas Jefferson University, in collaboration with prestigious institutions in Italy, has signed an agreement to launch the world's first-ever dual-medical degree program, enabling a cohort of physicians to practice medicine in both the United States and the European Union. Under the terms of the partnership, medical students at Catholic University of the Sacred Heart in Rome could earn a Bachelor of Science degree from Jefferson and Doctor of Medicine degrees from the Sidney Kimmel Medical College at Thomas Jefferson University and from The School of Medicine and Surgery at Catholic University in Rome – all within just six years. "These students will experience two unique academic environments and will study, train and treat patients alongside their US medical peers – giving both groups a broad understanding and appreciation for very distinct healthcare ecosystems", said Stephen K. Klasko, MD, MBA, President of Thomas Jefferson University and CEO of Jefferson Health. "Health care is global. This dual degree helps us create the global physician of the future." Medical education requirements in Europe and the United States are currently very different. In the US, students must earn a four-year undergraduate degree and then a four-year medical degree to practice medicine. In Europe, students interested in a medical degree matriculate directly from high school to medical school, completing all requirements to practice medicine within six years; there is no undergraduate degree requirement. Catholic University medical students who select the English track will have the opportunity to travel to Thomas Jefferson University to meet the United States' undergraduate requirements needed to pursue a medical degree. This option would not be possible had Jefferson not merged with Philadelphia University more than a year ago, according to Mark Tykocinski, MD, Provost, Executive Vice President for Academic Affairs at Thomas Jefferson University and Dean of the Sidney Kimmel Medical College; Jefferson did not offer undergraduate degrees before then. "For many years, Thomas Jefferson University has developed, nurtured and even expanded the very strong relationships we have with universities in Israel, Italy, India and Japan, to name a few," said Tykocinski. "Our students across all disciplines already work collaboratively with their counterparts across the world. Our partnership with Catholic University will allow European and US medical students to work-side-by side while expanding their physician-peer network across Europe." Leadership from Thomas Jefferson University, Catholic University and Gemelli University Hospital, where medical school rotations occur, gathered here Sunday to sign a definitive agreement to formalize the program. They also signed a clinical research agreement that will create collaborative research opportunities in both countries with an initial clinical trial to expand testing of a technique shown to be effective in treating difficult-to-heal wounds. 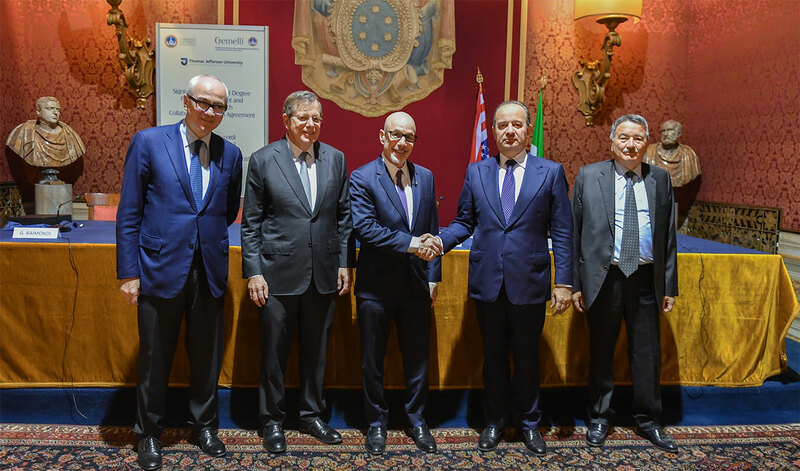 The ratified agreement was signed by the Rector of the Catholic University, Franco Anelli, the President of Gemelli Hospital, Giaovanni Raimondi, as well as Drs. Tykocinski and Klasko. Thomas Jefferson University is a leader in interdisciplinary, professional education. Jefferson, home of the Sidney Kimmel Medical College and the Kanbar College of Design, Engineering and Commerce, delivers high-impact education in 160 undergraduate and graduate programs to 7,800 students in architecture, business, design, engineering, fashion and textiles, health, medicine, science and social sciences. The new Jefferson is redefining the higher education value proposition with an approach that is collaborative and active; increasingly global; integrated with industry; focused on research across disciplines to foster innovation and discovery; and technology-enhanced. Student-athletes compete as the Jefferson Rams in the NCAA Division II Central Atlantic Collegiate Conference.